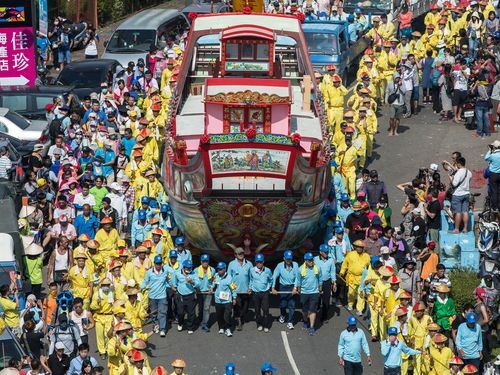 Taipei, Oct. 14 (CNA) A boat burning festival that is held every three years to ward off disease will begin Oct. 28 in the southern port town of Donggang in Pingtung County, the organizers said Sunday. 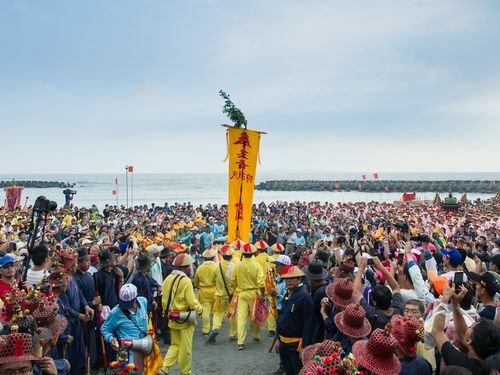 On the first day of the eight-day festival, a procession is gathered at the beach to invite five gods, known as Wang Ye, to come down to Earth to take away bad spirits, diseases and misfortune, according to a statement issued by Dong Long Temple (DLT). After that, starting on the second day, the gods will be carried around the town by bearers for the next five days so the gods can absorb the ills, said Wu Shui-yuan (伍水源), a member of the ceremony committee. On the seventh day of the festival, a wooden boat, decorated in traditional colors and motifs, will be paraded through the township to collect all the evil, disease and bad luck, Wu said. The festival will climax with an early morning ritual on the eighth day, in which the boat will be loaded with offerings and set ablaze on the beach near Zhenhai park to send the gods back to heaven, he said. This year, the ceremonial boat, built at cost of NT$7.6 million (US$245,840), is about 14 meters long, 2.5 m tall and 3.64 m wide, Wu said. Dong Long Temple is said to have started the festival about 100 years ago but the boat burning ritual dates back over 1,000 years.